The freedom of expression of individuals, communities and groups which constitutes the basic means for providing corrective feedback to our governments is under severe attack all across India. It is in this situation writers, artists, activists of Karnataka came together under Gram Seva Sangh and likeminded organization to held this protest. Some of the well know people joining the protest includes, Freedom Fighter H.S.Doreswamy, Theatre Person and Film Maker M.S.Sathyu, Writer Bolwar Mohammad Kunhi, Poet Mudnakudu Chinnaswamy, Film Director B.Suresh, Theatre Person and Activist Prasanna. The press is being muzzled through colonial laws including the Official Secrets Act drafted by the British to suppress India’s freedom fighters during our struggle for independence.Our rulers have been able to completely ignore the burning problems of the society only because they have succeeded in curtailing our freedom and misrepresenting our expectations and opinions. In such an environment, it is our primary duty to come together and publicly proclaim that “Silence is not an Option”. 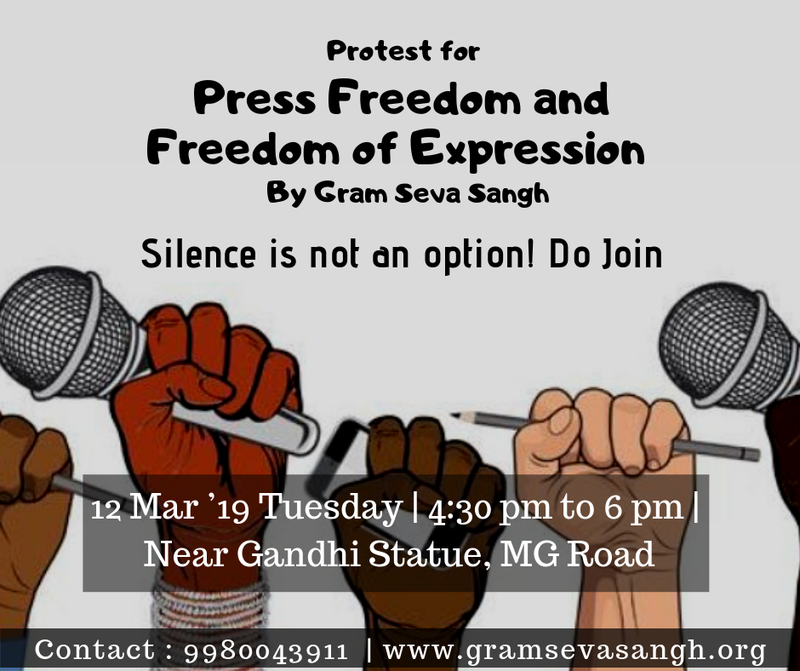 We protest the attacks on the fundamental rights of the citizens of India, and the suppression of the freedom of expression of the Press, individuals and communities and groups. Join us to oppose the attack on the Press and freedom of expression of citizens! Let us work towards building a new India that allows exemplary freedom of expression and tolerance for different opinions. Next Next post: ನಾನು ಒಂದು ಅಭಿವ್ಯಕ್ತಿ, ನನ್ನನು ಉಳಿಸಿ!